Welcome to the Shepherd's Garden Website. 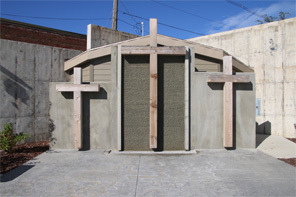 It is an entry point to the Shepherd's Garden. Take a visual tour at this website, then travel to the Shepherd's Garden and enjoy for yourself the inspiring Garden. 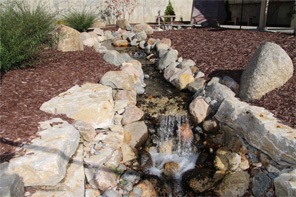 As you walk the sidewalk read the passages and Bible verses, appreciate the calming waters of the stream, enjoy the stones, plants and trees native to our region that reside in this very special place. Stand in front of the Crosses and reflect on the sacrifice Jesus did for us. Sit on a bench and witness the power of the things around you. As you then leave take some of that experience with you out into the world. Those With Little Faith & Those With No Faith. 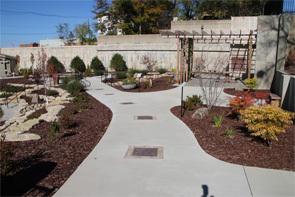 The garden presents a park like setting with maples, junipers, and arborvitae planted around the perimeter of the garden. Check out all of the features of the Garden. The Garden is open to the public for gatherings and special occasions. View the policies and fees associated with using the Garden. Your support will help us to keep the Garden well maintained for generations to come! Any size donation made is tax deductible. Click here to help support the Garden.